The dark-haired woman who paid Danielle Loukataris $950 for the little white dress made of plastic discs and metal loops wasn't famous, like Elvis Costello and designer Anna Sui, who were also wandering by her booth of old Buffalo clothes at the vintage clothing show in New York City. Loukataris figured the dishy young lady was smart to want the dress that a mom bought for her daughter at the Main Place Mall around 1967.Maybe the shopper was an actress. She'd said she had a big Halloween bash to go to. If she turned up in that little see-through dress, everyone would look. The attention might get her a job. "She's spending a lot of money on the piece, but she knows it's going to lead to something else," said Loukataris, explaining the kind of math that can go along with the newly booming trade in vintage clothes. That was a couple of weekends ago. Since Loukataris has been back minding her regular "Divine Finds" shop on Lexington Avenue in Buffalo, she's been mulling over the new popularity of vintage. "I can go to New York and move the prices up higher," she said. "The thing I've struggled with the most is, 'What price am I going to put on it?' "
Others in the business of finding, cleaning, and knowing that a metal zipper means a dress is at least 40 years old, say their sales are up, too. Interest is rising. Designers shop for vintage items to get ideas for new collections. Costumers shop to lower costs for movie and musical productions. Regular folks just like the original fashion looks -- rounded collars, nice buttons, swirled pink tweeds -- that still cost less than new stuff on store racks. Buffalo's closets are gold mines for such businesses. There are plenty of leftovers from the city's days as a boom town back in the decades when some of the most sought after clothes were in vogue. Estate sales used to focus on china and silver. Now, crowds flock to them to find well-made coats, sweaters, skirts and dresses with labels from bygone Fifth Avenue-type shops, such as Peck and Peck, and the city's old department stores. "The whole market of vintage clothing has changed," said Charmaine Then, co-owner of the Edna Louise estate sales company that sells the contents of houses for owners by posting signs along the sidewalks. 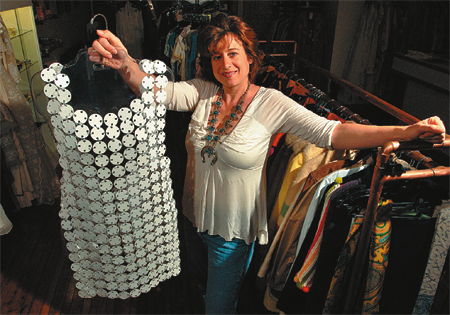 "I will take a sale filled with fashion even if it doesn't have antiques," she said. "People are looking for gloves again." Revenues have gone up as hard plastic purses from the 1950s "fly out the door." When Then started in the business 15 years ago, she told clients to give clothes to Goodwill and let her sell the silver and china. Now a belt or a blouse can sell for more than a tea set. Lately, when Then goes to examine houses and prepare for a sale, she's disappointed if there aren't any good clothes. A woman in one North Buffalo house that Then was working on had great taste but, she sighed, all the clothes were of the modern Banana Republic variety. The best recent find was an Italian woman in Clarence. She opened her closet and found leopard prints and snakeskin bags. "She had style," said Then. Estate sale shopper and Kenmore dentist Arlette Tucci Kirk admires the old fashions so much she usually wears one vintage piece a day. She likes the unique look and the compliments on her $5 finds. "There's just something about the style -- the attention to detail that you don't see in street clothing," she said on a day she was carrying a 1960s hammered leather purse. She buys from James Walaski, who runs estate sales, makes house calls and sells clothes at Clarence' Antique World. Walaski agrees that business is good now. He can sell 1940s rayon dresses for $50 and $75. Years ago, he couldn't get much more than $20. One of his friends has been doing so well that she quit her job as an insurance adjuster and started selling old Buffalo vintage clothes online full time. Even at higher prices, Walaski says his things are fashion bargains. A woman bought a pair of drop rhinestone earrings from him for $15. She then showed him a smaller pair she intended to return to J.C. Penney, where she'd paid $47. At a vintage clothing show this year, he'd been annoyed with a woman who was making messy piles of his clothes. That was until he realized it was the New York couture designer Anna Sui, who bought a $95 pin made of watermelon rhinestones. Years ago it would have fetched $25. "It's an adrenaline rush," he said. His surprise customer, Sui, is known in fashion circles for glamorizing the pirate look in the early 1990s. She is also known for using old clothes as inspiration. "I usually go to flea markets," she admitted. Her last collection of pastel silks was based on hand painted French drawings from the turn of the last century. She's out looking again and hasn't decided yet what her newest collection will be. Her best most recent find was some embroidered slippers from a market in Beijing. Old clothes and shoes -- she bought a pair from Loukataris once -- also help when she's trying to explain what kind of leather sheen she's after for her shoe line. "It's just another tool," she said of vintage. For costumer Todd Kauchick, now working on a musical version of the 1954 movie "White Christmas" opening in several cities, vintage clothes save money. Two Buffalo-area sources he found in a clothing show source book were among those who supplied him with suits and handbags. It would have cost thousands of dollars to custom-make costumes for the 33 actors and singers in three productions opening in Boston, San Francisco and Los Angeles in November. In the past months, he has called Amherst's Molly Carroll and Loukataris with questions like, "Could you find me a red and green plaid swing coat?" "If this year goes well with these three companies, we'll be adding more cities," he said. "We will likely be knocking on your doorstep again next year." As more people find their way to Loukataris by word of mouth and the listing she gets for selling at the New York City clothing show, she said finding and selling old clothes becomes more of a thrill. Boredom while staying home with her young son led her to poke around on clothing Web sites and get curious enough to try her luck with garage sale finds. That led to eBay postings -- a 1900s Chinese kimono she found at a boutique sold for $900 in two days -- and a Web site. To learn more about the business, an online vintage clothier friend let her work for free for a weekend at a New York City vintage sale. There Loukataris was surprised to see women drop $400 on old designer dresses. After some library and online research, she learned more about things such as the $350 value of the psychedelic swirls of a genuine, but stained 1960s Pucci dress. "My taste got better and better," she said. In the last three years, she has set up her own booth at a New York City show, opened a shop on Starin Avenue in Buffalo and then, last summer, she relocated to a bigger place on Lexington Avenue. Along the walls, she has hung patterned and flowered bathing caps and photos of the celebrity shoppers who have stopped by her booth in New York City. One shot has designer Donna Karan, who bought a giant pair of square 1970s sunglasses, which are in fashion right now. Another shows film director Sophia Coppola. The interest keeps Loukataris hooked. When a shopper at the New York show spotted a box from the old L.L. Berger department store, she stopped to make a call on her cell phone to her mother. It turned out people from the Berger family were her friends. That made Loukataris wonder. What if they could lead her to her dream find? Some old 1960s beaded evening gowns. Maybe some Chanel and Pucci. All waiting in a warehouse somewhere. With the original tags and prices. "I said, 'Can you tell them to call me please?' " said Loukataris. "I want to know if they still have anything."